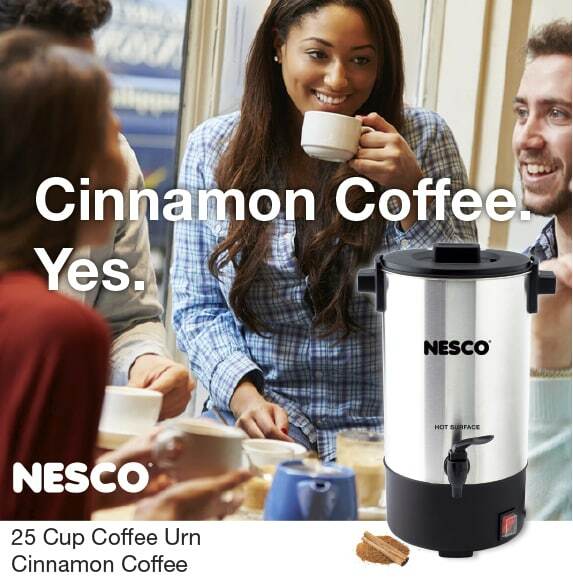 For your next party treat your guest to a cup of Fresh Brewed Cinnamon Coffee from your NESCO 25 Cup Coffee Urn. Simply add two to three teaspoons of ground cinnamon sprinkled over your favorite coffee grounds before brewing a full urn. Not only does it add a light wonderful flavor, the aroma is absolutely heavenly. For a creamy and sweeter flavor, serve with half-and-half and your favorite sweetener on the side. Your guests will love it. Experiment with various amounts of cinnamon, or other additions such as a dash of nutmeg. Let us know what you think. Also share with us some of your favorite coffee tips.